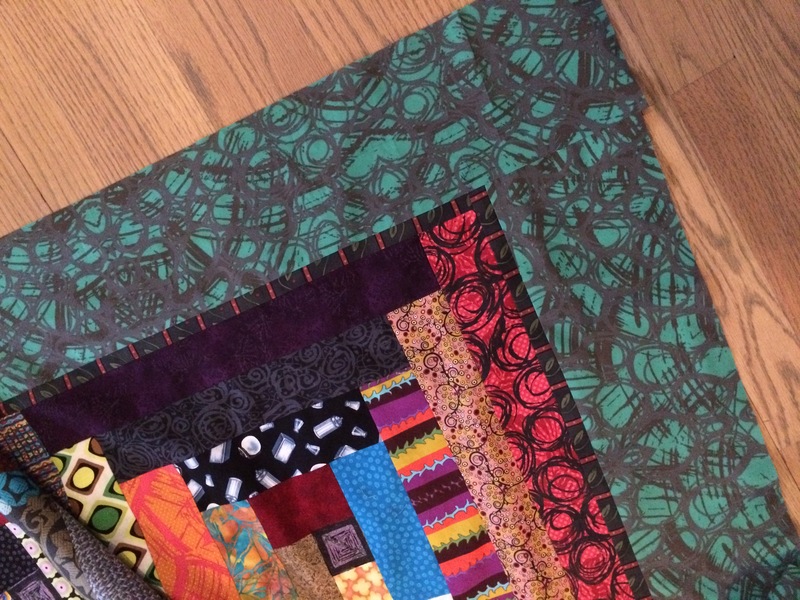 I am having a great time working on a couple of new quilts. I am using the same log cabin format that I used for the first 18, but this time I changed the scale to see what would happen. 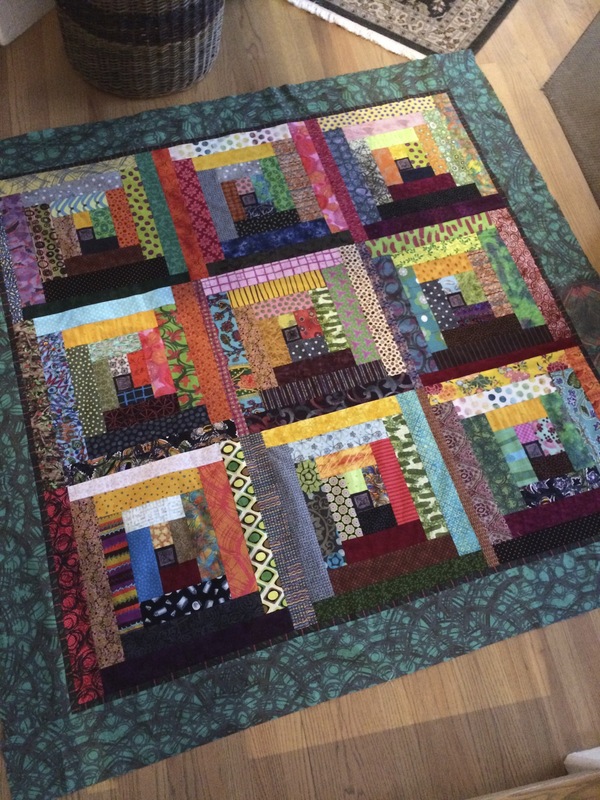 My first quilts were made up of 16 squares with various borders. 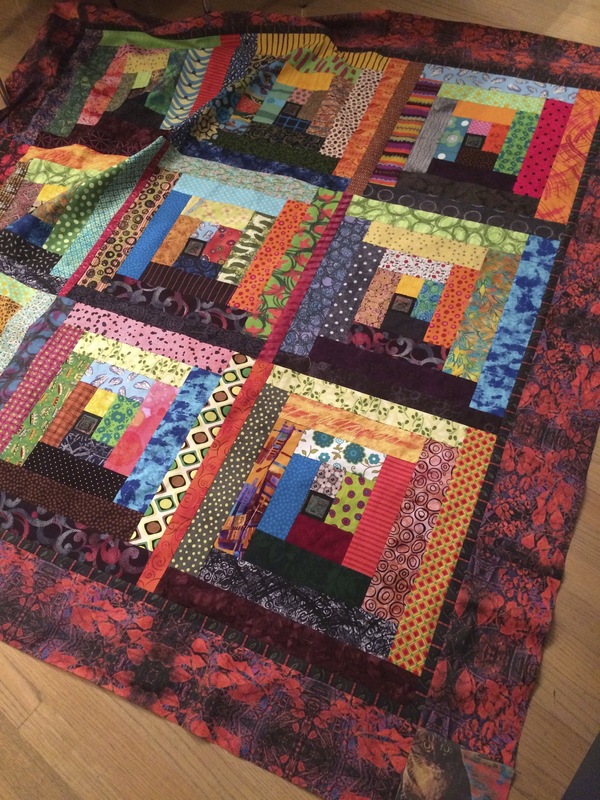 The newest quilts have only 9 blocks with simplified borders. i need to carve a couple of new stamps to add some printed texture, and these will need to be larger than what I have made in the past. Check out timetobeinspired.ca you say? or quilt love to see some of the earlier quilts. You can see some of the circular images that are stamped on the surface. I want to explore some new designs. 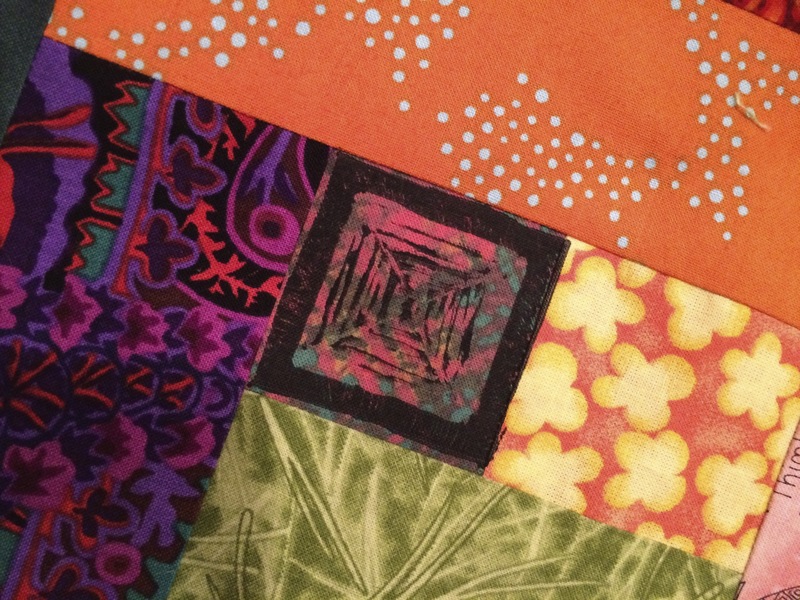 The new quilts include a variety of fabrics from my extensive (yes, that’s a polite word for it) fabric collection, some of my hand silk screened fabrics and some of my designs which I had printed at Spoonflower. It was terrific using this assortment! I decided to only do 2 quilts at a time, and not 6 like I have in the past. This way I can test out different ideas more quickly. I’ll let you know how that works out. Here are a couple of photos of works in progress. The tops are sewn but need more stamping. I did carve a square block to stamp over the center squares of the quilt, as I thought the centers needed more emphasis. 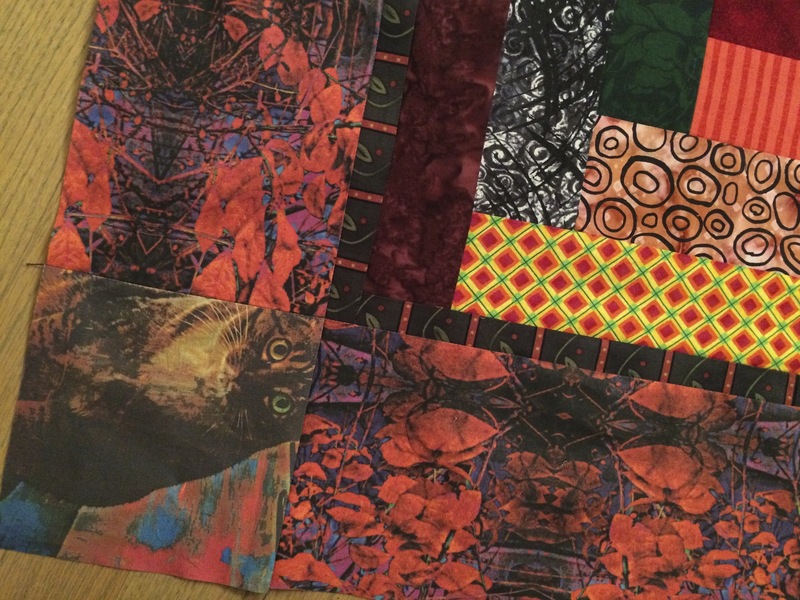 It obscures the print that I used (my own printed fabric) but there wasn’t much to see in a 1 3/4″ size square. 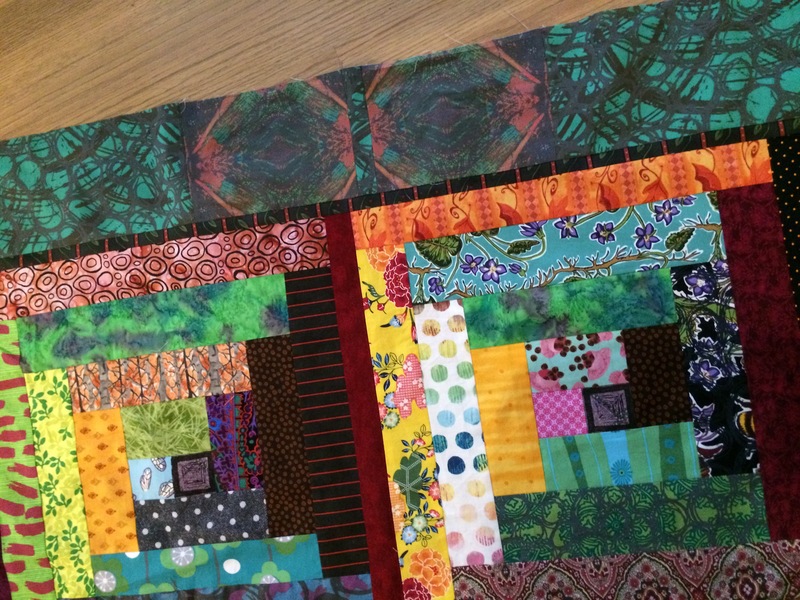 The quilt backs are sewn and when everything is ready I’ll have them layered and quilted. After that’s done I can choose the binding fabric and finish them. Nothing like a MULTI multi step process, right? Prev Thank Goodness – my blog is still here! Thanks, Debra. I’m sure it will rub off. . If you check some of my old posts you’ll see some photos of some of my fabric stash – enough to make you feel better about yours I’m sure! Happy stitching. I went back through some of your archives, Terri, and just fell in love with the beautiful tile work you did on your house. You are very talented! I like your designs Terri. Thanks, Ranu. They make me smile.